KGH plays an important role in international trade and we are determined to continue contributing to sustainable growth – for our stakeholders, for ourselves and for the society we are a part of. Below you can learn more about KGH sustainability programme. The programme expresses our focus areas, the sustainability goals we want to contribute to, and how we achieve those. Economic growth based on increased international trade is a prerequisite for many of the UN’s 17 Sustainable Development Goals. Facilitating trade is also KGH mission. It lies in our legacy for 50 years and is our driving force forward. The solutions we provide help our customers prosper in a responsible, sustainable way by aiding them in accessing new markets and improving performance in existing ones. As we grow, so does our ability to improve our services, to enable us to work together for sustainable growth. We@KGH believe everyone bears a responsibility to contribute towards a sustainable future. 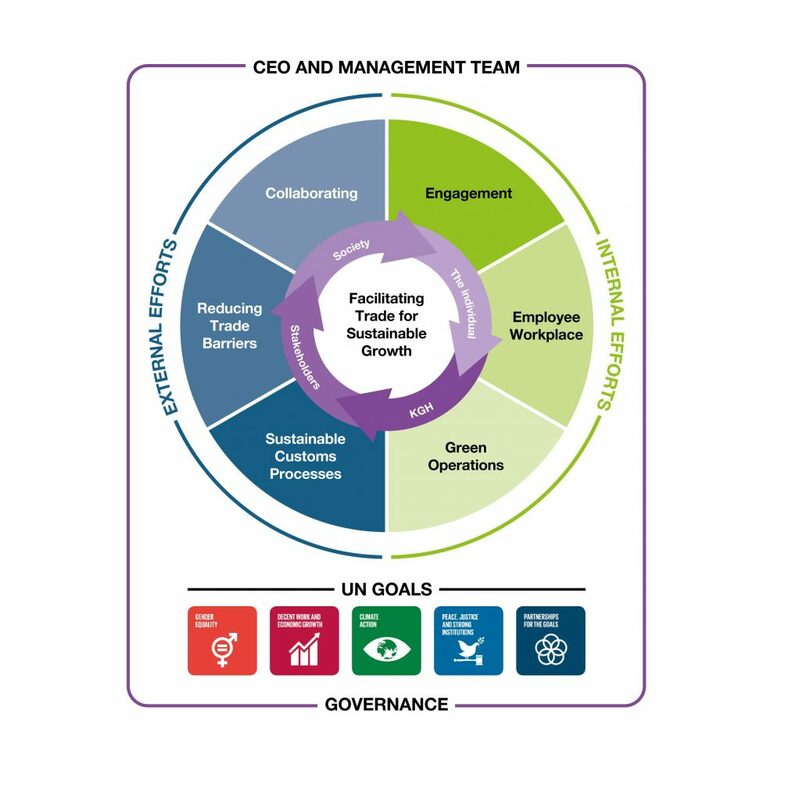 KGH has a history of having a facilitator role in the world of international trade, and we know from experience how ideas, engagement and action have a domino effect. That is why all action starts with the individual. However, engagement also creates a circle where societal change triggers individual engagement, which is why we see sustainability as a self-strengthening circle moving toward the future. KGH pursues the sustainability work through six focus areas to reach set goals. They are divided into external and internal efforts. Creating efficient, sustainable and scalable customs processes to ensure international trade is a facilitator for business growth. The increased development of digital automation in the world affects us all. Within customs services, digital automation helps us achieve fully scalable customs processes that minimize paper waste and lead times. It also allows our customs experts to free up more time to continuously improve customs processes ensuring international trade continues to be a facilitator for business growth. Our software endeavour has one single purpose in mind; facilitating trade through efficient, scalable and digitized customs processes. With our coming CTDS suite, we are confident that we are reaching our goal. As trade is based on supply and demand, volumes fluctuate and routes change, and we want to contribute with digital customs processes that handle the flexibility and complexity of the real world, while eliminating waste paper and cutting lead times. Governments are core stakeholders – as partners, controllers and customers. They are also forums to which we always want to bring the voice of the traders and businesses involved in international supply chains. As international trade and customs compliance gets ever more complex, we want to contribute with a real-world perspective, working towards processes that are efficient, scalable and sustainable for businesses. Supporting governments in implementing trade-facilitating systems and programmes, while helping the private sector to use them for a better trade. The WTO- and WCO-based Customs-to-Business partnership known as the Authorized Economic Operator (AEO) or Trusted Trader programme is central to the international standardization of processes, simplifications and security related to customs. KGH is world-leading in implementing AEO programmes and AEO Mutual Recognition Agreement (MRA) models on a government level, with successful project implementations in Australia, Brazil, CEFTA, EU, Iceland, Saudi Arabia, UAE and many others. We are also supporting the private sector in achieving, maintaining and utilizing AEO status. Standardization is one of the main tools to reduce trade barriers and facilitate trade. Using WCO and UN standards, our expert teams in border management are helping governments across the world to optimize their processes and technology for border crossings. We are also involved in BPR and technology projects with governments to fully digitalize border crossings and further optimize processing time thanks to the implementation of Single Window, One-Stop-Shop and advanced Risk Management solutions. In addition to improving the flow of goods and countries’ export capabilities, optimized borders also reduce queues and waiting time, which in turn reduces CO2 emissions and waste. Our Customs Academy, providing digital and classroom training through blended learning, educates supply chain professionals all over the world in how to cross borders in the most sustainable way. Contributing to a more sustainable future through close partnerships with both public authorities and businesses. Generalised Scheme of Preferences (GSP) is a system allowing developing countries to pay fewer or no duties on exports to the EU, providing access to EU markets and facilitating growth through trade. As this is in line with our beliefs, we are constantly promoting and supporting our customers to utilize GSP solutions and start importing from developing countries to extend partnerships in trade – and facilitate growth where it is needed the most. We have acquired a wide network of customs service providers to provide our services throughout Europe. This network is a continuous forum for identifying how customs service providers can contribute to a sustainable future. With a special role in the market as specialists in international customs legislation and management, we are actively participating in many interest and competence networks to help improve competence and develop international trade. These networks include European Liaison Committee of Common Market Forwarders, Trade Contact Group in the EU Commission, several Chambers of Commerce as well as many other national and international forums, committees and projects. We believe these networks are an important foundation in sustainable growth. Contributing to increased well-being by stimulating employees to engage in the sustainability work and the development of new initiatives. By forming a KGH Sustainability Foundation, all initiatives are centralized within the KGH Group. The foundation consists of many voluntary members from different countries who manage and coordinate initiatives like donations and free access to customs consultancy and declarations for our charity partners such as Save the Children and Red Cross. Our people are the greatest asset within the KGH Group. By training and encouraging them to support sustainability efforts, we create engagement at a much broader level. Training can cover anything from anti-bribery & corruption to business ethics. Employees will be able to participate through low-level entries like special mailboxes or the intranet, Zone. Creating and maintaining an inclusive and attractive workplace culture that delivers sustainability for the organization into the future. It is our fundamental belief that all employees shall be treated equally, fairly and with respect. Irrespective of gender, age, religion, ethnicity, cultural and social background, birthplace, disability, gender identity, gender expression, sexual orientation, political view or union representation. A true international company has an inclusive mindset where diversity is appreciated – and we strive to take full advantage of all the knowledge and experience we have in the organization. Working at KGH means working in an international environment together with passionate and highly competent colleagues. Our focus is to create a positive work environment to attract, recruit, develop, engage and retain our talents. Offering good working conditions and work environment (#greatjobsforgreatpeople) is as important as supporting a good balance of private and professional life. Considering the environmental impact is a key aspect of the actions and decisions we take to drive our business. In the world of customs, it is all about documents. A lot of these documents need to be archived for legal purposes, which is still done using paper archives in a lot of cases. By changing to digital archiving, a lot of savings can be achieved in paper resources and printing. Also, with current Internet speeds and streaming services, investing in digital meeting rooms allows seamless interaction but without the environmental burden of travel. The sustainable operation can be achieved by many small and large changes in day-to-day operations. These can vary from ecological printing (only when necessary and double-sided) and separating waste for recycling to using green suppliers (green energy, recycled toner cartridges) and low energy devices (LED lights, thin client computers). In green IT, we strive to choose equipment as well as design data centres in ways that maximize energy efficiency during their lifetime and with as little environmental footprint as possible (e.g. use of hazardous materials, the biodegradability of unused and outdated products).